You know how they say that some super successful people wear the same thing everyday, like a uniform? They do this because every decision takes up the same mental space. So picking out an outfit taxes the brain as much as deciding which side of the computer should hold the power cord, or when to let the paint dry on a masterpiece. To some that is too much of a tax to pay, so they take the clothes decision out of the equation, “I’ll wear a mock turtleneck and jeans, or a blue suit, or a meat dress, everyday.” This leaves more room for the bigger creative decisions, and leaves some super achievers devoid of fashion. For me this makes sense because every decision I have to make is met with category 5 panic. Every outcome is either save the city or total devastation. Where to eat, which case for my phone, is it time for a haircut, feel like the joint chiefs of staff are waiting for an answer. This can be paralyzing, it’s why I eat at the same places often, it’s just that shopping in any form is undesirable, and I have to figure out my uniform. 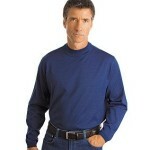 I guess this is why I am seeking therapy, and trawling the web for mock turtlenecks. Wish me happy hunting.